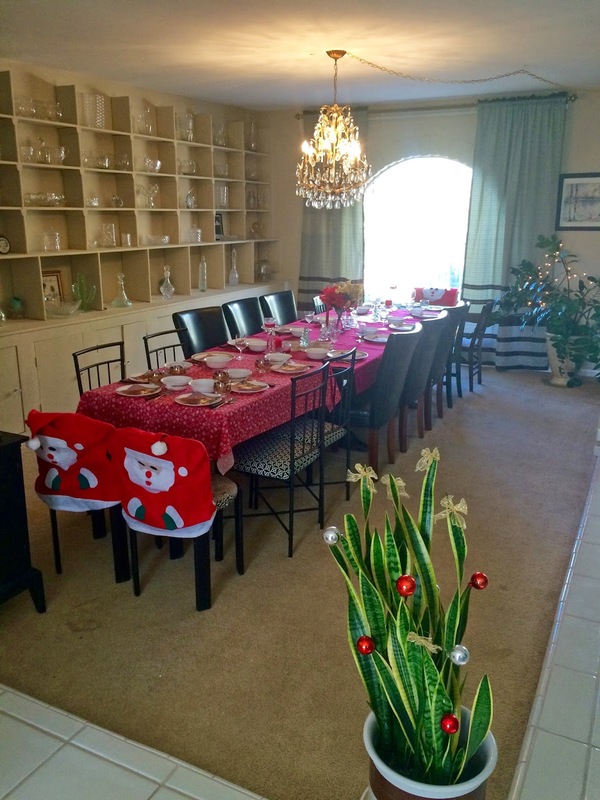 The Christmas Table, set up and waiting for hungry family and friends. We hosted seventeen people this year, the most I've cooked for yet. I decided to nix the appetizers because I had soooo much to do and I didn't want to a) make more work for myself or b) fill my guests up before the main event. I made a giant gravy that included 12 country pork ribs, 30 links of sweet Italian sausage, and 60 meatballs. I made 4 pounds of rigatoni and 3 pounds of thin spaghetti. For the macaroni, for those who were interested (me! me! me! ), I set out two pounds of ricotta. I had a request for garlic bread, so we had three giant loaves, one wheat. That didn't turn out as bad as I expected. The desserts were numerous - I didn't make any of them, they were all brought by family members - two ice cream cakes, cookies, cheesecake, cheese danish, ice cream, and chocolates. By the end of the evening we were, as Ed would say, "full as tics". looks gorgeous and sounds delicious Salena. Why can't we have that instead of stupid turkey and brussel sprouts. Have a great break.